When I first moved out of my parents’, I moved halfway across the country to Southsea with my husband, where we lived for just under a year. Because it is the first place I lived outside of the Midlands, it will always have a fond place in my heart. This month we stayed in Southsea for a weekend break and knowing that the town boasts a huge variety of restaurants, I researched online for where would be good to eat. I came across Sakura, a Japanese restaurant with an emphasis on sushi and noodle dishes, which is on Albert Road in Southsea, where a lot of the quirkier shops and bars are located. We visited on a Saturday night when it was very busy, but even so the waitress was able to find us a table. The décor is very traditionally Japanese, simple with booth type tables and Japanese decorations, with a laid back atmosphere. Two massive white lucky cats sit in the window. 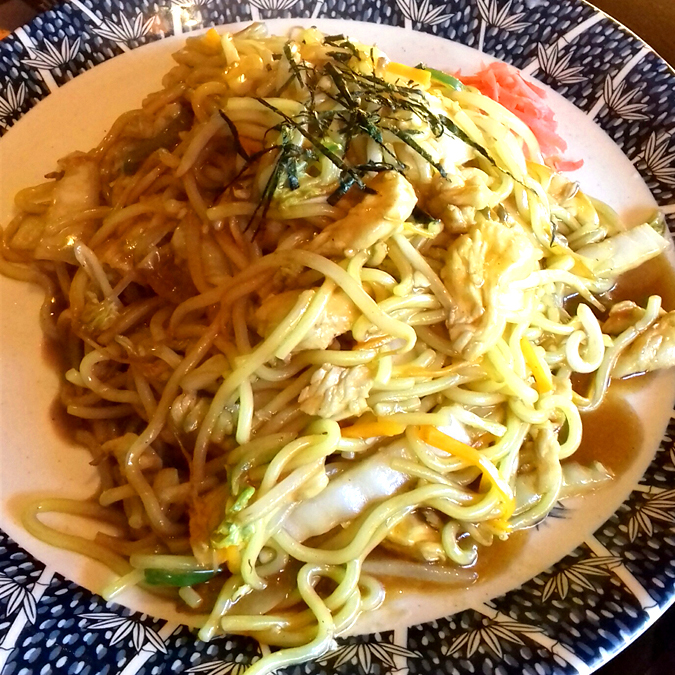 I had already looked at the menu online, which had everything from sushi to yaki soba to teishoku sets, but I was pleased to find when I looked at the menu in the restaurant that they also did ramen. It was very difficult to pick what to eat from so much choice, but I had to choose ramen, didn’t I? 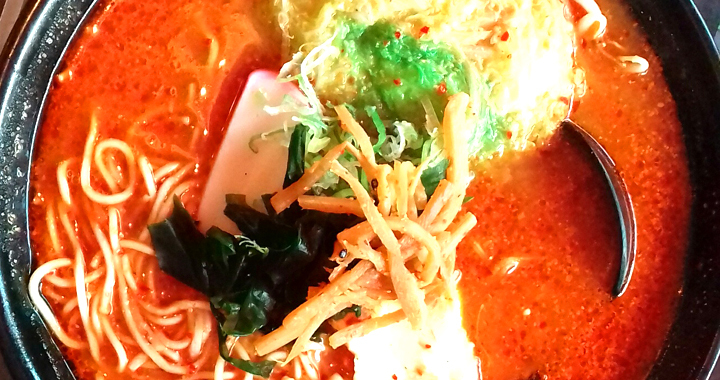 I opted for the spicy chicken ramen and my husband ordered the chicken yaki soba. We also ordered the seaweed salad and squid tempura as sides. The one disappointment was that as we don’t drink alcohol, the only drinks on offer were the usual coke, lemonade etc. It would have been nice to see ramune or Calpico, or another typically Japanese soft drink on the menu. The food came out swiftly with the seaweed salad and squid arriving first. 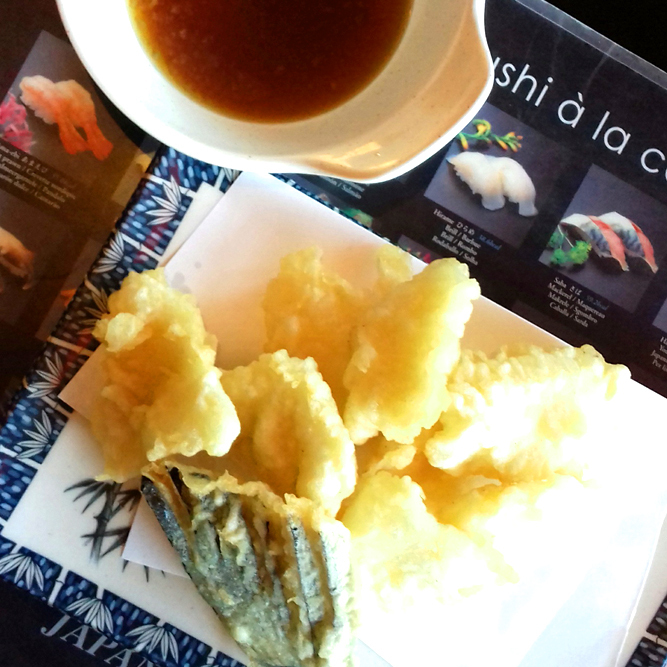 I’ve never had squid in tempura before but the batter was lovely and light and the squid perfectly cooked. There was also a piece of tempura aubergine, but whether it was garnish or slipped onto our plate by mistake I’m not sure- it tasted great anyway! The squid came with a dashi based dipping sauce, which I found a bit bland and preferred to dip it into the spicy broth of my ramen. 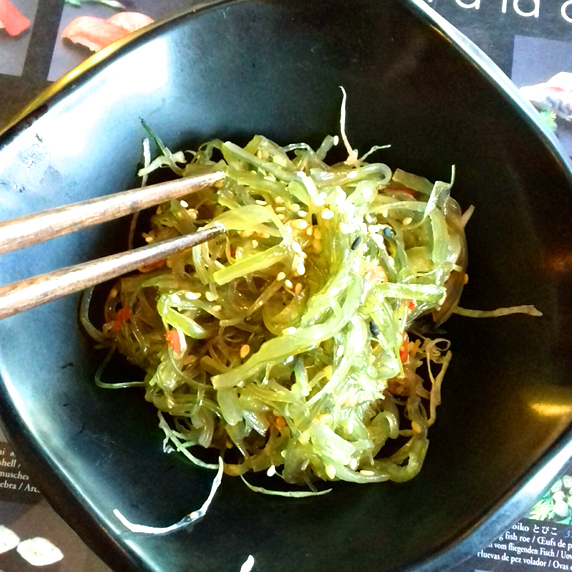 The seaweed salad is one of my favourite sides to order because of the crunchy texture of the seaweed combined with the strong flavour of sesame and this had a perfect balance of flavours. I was a little dubious about how good the ramen would be, given that the restaurant is not specifically a ramen bar, but when it arrived it looked great. 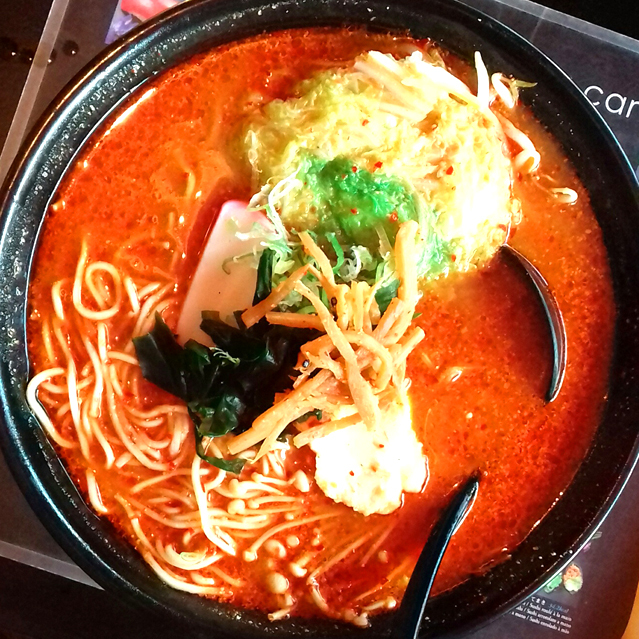 A big bowl of bright red broth with chilli, slices of chicken, bamboo shoots, Chinese leaf, enoki mushrooms, wakame, beansprouts and naruto fish slices. The broth tasted great- obviously matured well with a meaty stock and I’m guessing some kind of chilli pickle or sauce. It had a great depth of flavour and was spicy without being blow-your-head-off hot. The vegetables in the ramen worked really well; I always love Chinese leaf for the way it absorbs flavours so well, especially in a soup or broth. The beansprouts were marinated in a similar way to the beansprouts salad recipe I make. The noodles had just the correct amount of bite. I think the only thing that let it down was the chicken slices, which looked like they might have been bought in ready prepared and very extremely bland. A bit of marinated boneless chicken thigh would have been a great addition. I tried my husband’s yaki soba, which although he chose the non-spicy version (or what I would call the ‘boring’ version! ), tasted really great. The two main dishes with the salad and squid were plenty to feed the two of us for our main meal. They did have a desserts menu, with mochi, green tea or sesame ice cream and fritters, but I was too full to eat anything more. This is definitely a place to have a great, relaxed meal in a traditional Japanese environment. The food is great and tasty, affordable and the choice is great. The staff are friendly and helpful and managed to squeeze us in without a booking despite it being very busy that evening! If you live in the Hampshire area or are visiting Southsea and Portsmouth, head to Sakura on Albert Road for a great Japanese meal. Posted in Restaurant Reviews, Reviews, Uncategorised and tagged Hampshire, Ramen, Restaurant, Reviews, Southsea.